Helambu valley trekking is one of the easier trekking trail in langtang region which can be done with in 7-10 days. 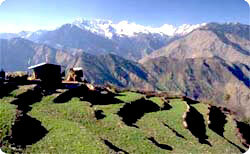 Helambu trekking offers superb Himalayan views including the Mt. Gaurishanker, Dorje lakpa, Rolwaling Himalayan range, lush valleys , green forest , Tibetan sherpa culture , fabulous Buddhist monastery etc. Helambu valley is lying some 72 kms north east of Kathmandu, situated at the head of the Melamchi Khola. Bounded on the north by a wall of 5000 m peaks, it extends northwest to the lakes of Gosainkund and east towards the lower slopes of the Jugal Himal. Helambu region is corrugated by a number of valleys and ridges running north-south through which runs the headwaters of the Sun Kosi river, the Yangri and Larkye, with the Melamchi Khola being the western most tributary. Since Helambu valley trekking trail has been open numerous trekkers made trekking in this area because of it is very closed to kathamndu , not very high elevation and trekkers who has limit holiday duration for Nepal . The warm hospitality of sherpa make this trekking trail much busy even it is less famous trekking trail in Nepal. The population here is predominantly Sherpa and scattered around the Melamchi Khola area are several picturesque Sherpa villages and Buddhist monasteries. Helambu valley trekking is an ideal area for those with limited time for trekking, especially in the spring when the rhododendrons are in full bloom . Himalaya journey Treks and expedition arrange the Helambu valley trekking according to trekkers holiday duration and wish. Himalayan sights: Langtang Himalaya range, Dorje lakpa & Gaurishanker. Day 01: Arrival in kathmandu 1334m, Himalaya Journey Treks & Expedition’s representative will transfer to hotel , Helambu trekking briefing with officially arrangements. overnight at Kathmandu. Day 07: Tarkeghyang Trek to Shermathang (2621m) . Day 09: Mrlamchi pul bazaar drive bus to Kathmandu (1350m)/transfer to hotel.overnight at kathmandu. Day 10: After breakfast, our tour guide will take to for historical monuments sightseing in kathmandu valley such as Bhaktapur, Pasupatinath, Boudhhanath, Kathmandu durbar square and Monkey temple(swyambhunath) and in the evening farewell dinner in Restaurant, overnight at kathmandu in Hotel. Day 11: After breakfast, Relaxing/shopping with own activities ,Himalaya Journey Treks & Expedition’s representative will drop to Kathmandu international airport for onward destination.